We are now a direct authorized dealer for wilwood engineering. We should be able to beat any prices you see on the internet. See it cheaper, let us know, we want the sales. Wilwood is a manufacturer of high performance disc brake systems. In the Thirty years since Wilwood was founded in 1977 we have developed a substantial matrix of brake components and engineering techniques that allow us to quickly and reliably create brake systems for almost any application. Our core ability is the rapid development of custom engineered brake systems using a combination of off the shelf and custom components. 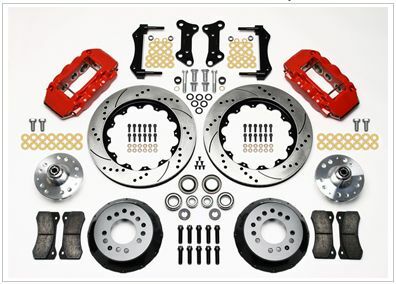 In addition to designing and manufacturing brakes for all types of competitive motor sports, Wilwood also manufactures brake systems and components for agricultural equipment, industrial applications, utility vehicles, snowmobiles, quads, motorcycles and military vehicles. Wilwood brake kits and pads! www.VSpeedUSA.com <-- more cars, more parts + worldwide shipping. will the wilwood bbk for the 370z fit the GTR? One part rubber, three parts Krazy Glue. The stock GT-R brakes are better than the Wilwood's, why would you want those?